Welcome to the ACE CRIS & SIS Home Page! ACE launched successfully on 8/25/97; both of our instruments were powered on on 8/27/97 and are working great! 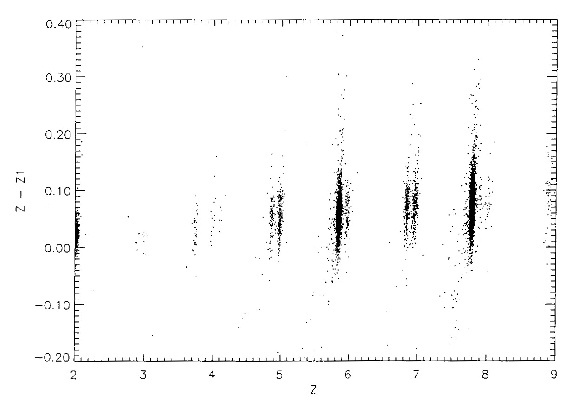 The above scatter plot shows a sample of data collected from the Cosmic Ray Isotope Spectrometer (CRIS) during the first 4 days following turn-on of the instrument (27-30 August 1997). A total of approximately 35 hours of data are included in this plot. Each point on the plot corresponds to one measured particle. This graph includes cosmic ray nuclei with charges (plotted as the abscissa) ranging from Z=2 (helium) to Z=9 (fluorine) which stop in CRIS's stacks of solid state silicon detectors. Plotted as the ordinate is the difference between charge determinations made using two different combinations of detectors. This quantity is useful for eliminating more complex events (e.g., those in which the particle fragmented in the instrument or exited before stopping). The bands of data points for each element are composed of separate sub-bands corresponding to the individual isotopes of the element. Among the isotopes for which resolved bands can be seen are beryllium-7, 9, and 10; boron-10 and 11; carbon-12 and 13; nitrogen-14 and 15, oxygen-16, 17, and 18). In order to convert the numbers of events on such a plot to relative abundances, corrections must be made for differences in energy intervals and detection efficiencies for the different particle species. The Solar Isotope Spectrometer (SIS) and the Cosmic Ray Isotope Spectrometer (CRIS) are solid-state charged particle telescopes, designed to measure the composition and energy spectra of solar energetic particles, anomalous cosmic rays, and galactic cosmic rays. These instruments make measurements of charged particles from hydrogen (atomic number, Z=1) through zinc (Z=30) over a wide range of energies and are complementary to seven other experiments also flying aboard the NASA Advanced Composition Explorer (ACE) spacecraft. A further discussion of this technique is available here. An archive of CRIS and SIS papers will be available here soon. Currently rate and housekeeping plots for both CRIS and SIS are available by anonymous FTP. They are huge (many MB, and tens of pages), so get them at the risk of your own disk space! There have been 186,139 visitors to this page since 12 Feb, 1998.